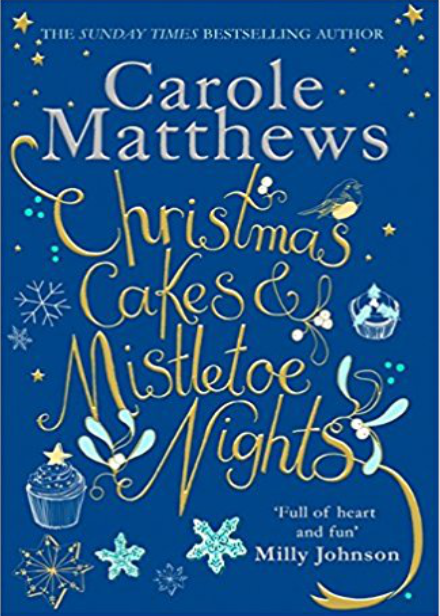 ’Christmas Cakes And Mistletoe Kisses’ is the latest book by Carole Matthews. Fay and Danny are madly in love and it’s all Fay’s ever dreamed of. But she left everything – including the delightful cake shop she used to run – to be with Danny on his cosy canal boat The Dreamcatcher. And as she soon finds out, making delicious cakes on the water isn’t always smooth sailing! Then Fay gets a call from her friends, a call that sends her back to her friends and the Cake Shop in the Garden. It will be hard being away from Danny but their relationship is strong enough to survive . . . isn’t it?Fay soon falls happily back in love with her passion for baking – especially now she’s on dry land again! – and starts to wonder if she ever should have left. With Christmas around the corner, Fay is determined that her friends will have a very merry time, but does that mean even more time away from Danny? Carole Matthews is back with a cracking new book that will warm the cockles of your heart on these cold winter evenings. In her latest book, we return to the characters Fay and Danny who we met in one of Carole’s earlier books ‘The Cakeshop In The Garden’, where Fay met the Danny who offered her a happier and more fulfilling life on his canal boat. Together the two of them and their little dog Diggery leave for a life on the water and this is where ‘Christmas Cakes And Mistletoe Kisses’ picks up. Fay and Danny are in love and living the life, but money is tight and the pair are struggling to make ends meet. So when Fay receives word that Stan, an elderly friend is ill, she immediately returns home to care for him and once back in the loving arms of the her childhood home and back with her friends, Fay finds it impossible to leave. Once again, Carole has written a book filled with warm hearted characters with a lovely plot that made for tender reading. Fay, is a lovely character with her huge heart and generous nature, she always put others before herself, particularly her sister Edie, who’s quite a selfish woman, but Fay can’t help but look out for her sister, who seems lost in life. There’s also the sharp tongued but entertaining Lija, who never failed to make me laugh with her expressions and honesty, whilst young Rainbow added such an injection of spirirt and vibrancy into the tale with her innocence and lust for life. The story flows at a lovely pace as Fay settles back into life on the land and back where she belongs, baking and surrounded by her friends and helping others around her. Wonderfully written with witty narrative and enchanting characters that will make you giggle from the start, ‘Christmas Cake and Mistletoe Kisses’ is a heartwarming and fun christmas story, filled with charm, love and festive cheer, this book will brighten up any cold winter evening. You can buy Christmas Cakes and Mistletoe Nights from Amazon and is available to buy from good bookshops.